Back when Hungarian villagers baked their bread in brick ovens, they'd save a little bit of the dough to make a breakfast treat called lángos. This savory flatbread got its name from where it cooked—right by the láng, or flame, at the front of the oven. As home baking became less prevalent, lángos evolved into a deep-fried street snack that looks a little like a pizza. Purveyors fry circles of yeast dough to form the chewy, crispy base. It's then traditionally rubbed with fresh garlic and slathered with sour cream and grated cheese, but can also be loaded up with toppings such as ham, mushrooms, and cabbage. 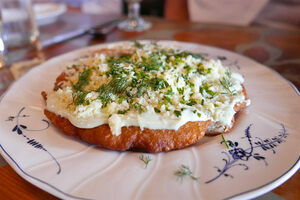 Sometimes cooks mix mashed potatoes into the dough to make a version called krumplis lángos. A filling breakfast and trusty hangover cure, the beloved gut bomb also reminds Hungarians of summers at the country's Lake Balaton, a popular vacation spot where you can find stalls of vendors selling fried discs the size of dinner plates.